“We did it!” was heard behind the curtain following Ballet Hispánico’s world premiere of Edwaard Liang’s El Viaje (The Journey). And yes, they sure did in a creatively diverse program at The Joyce through Sunday, March 31. All three ballets explored community. Notes accompanying El Viaje describe it as an “exploration of identity and the ghosts of a former life.” The ghost is a woman (Melissa Verdicia) in red – the great dance color signifying uniqueness, magic or sensuality. Here, she is an exile from China and/or Cuba (hence red). She moves away and occasionally joins male and female dancers dressed in pale colors. It’s apparent she is no longer one of them, but they repeat her movements, as she does theirs. Diaspora doesn’t change everything. Ironically, El Viaje is guided by Ralph Vaughan Williams’s Fantasia on a Theme by Thomas Tallis. The British composer is not a colonialist choice but an inspired one. His haunting music contrasts the onstage tension. Liang takes full advantage of the music’s elegiac melodiousness with sweeping arms and high lifts. (For the next 20 days, BBC Radio 3 is streaming the Fantasia and Talis’s original Third Mode Melody). 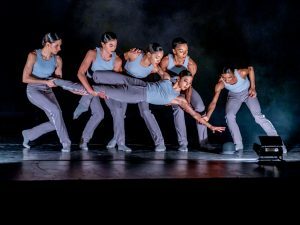 Annabelle Lopez Ochoa, latest recipient of the prestigious Jacob’s Pillow Dance Award, first choreographed Sombrerísimo (Hats) for Ballet Hispánico in 2013 for an all-male cast of six. This season, it’s danced by an all-female ensemble, who on March 26 were Shelby Colona, Jenna Marie, Gabrielle Sprauve, Eila Valls, Dandara Veiga and Melissa Verdicia. Clad in tee-shirts and loose pants, they are a high-spirited unit celebrating the bowler hat. Echappé jumps (in first position with legs turned out, jumping and returning to the same spot) mimic Magritte’s hatters. Ochoa avoids surrealism, opting instead for ballet, jazz, gymnastics, team dance and Broadway (but not that other hatter Bob Fosse) to a Latin beat. The “How did they do that?” result is exhilarating. It also proves that unless a part is gender specific, it doesn’t matter who’s dancing it as long as they’re doing it. The world premiere of Bennyroyce Royon’s Homebound/Alaala closed the program. In it, the Filipino-American choreographer/dancer creates an effective scenario of bayanihan – that is, communal unity. Royon is a great storyteller, sustaining the diaspora narrative while allowing the audience to fill in details for themselves. The work could easily be expanded into a full act. One device he uses effectively are boxes the barefoot dancers pulled and/or lifted representing housing, suitcases…and walls. Another is alternating Filipino music with silence. Amanda Gladu’s brightly colored, dance-friendly costumes of woven sustainable Filipino fabric completed Royan’s stage picture.